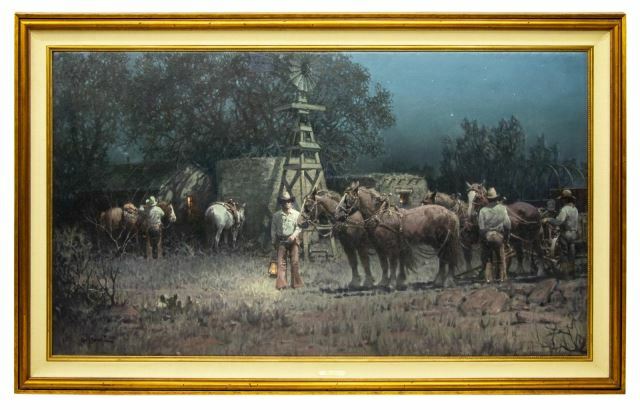 Austin Auction Gallery's sales are offering over a thousand paintings, furniture, antiques and more, sourced from the American West to the English countryside. Melvin Warren's large-scale painting (4 x 7 feet) Before Dawn depicts a Wild West scene of cowboys saddling up their horses at a western camp. The artist was born in 1920 and grew up on ranches in New Mexico and Texas and was always inspired by the American West, often portraying cowboys, Native American Indians, ranches, horses and more in his work. He was a member of the Cowboy Artists of America, where he was awarded for his historical landscapes. 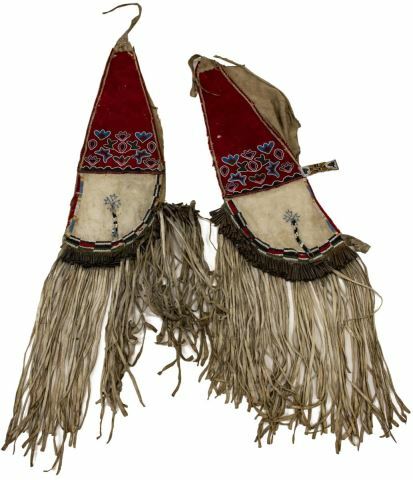 These beaded cruppers (a piece of tack attached to a horse's saddle) are from the Native American tribe the Crow Indians and were part of their elaborate horse regalia, for which they were known. The Crow tribe was based in the Yellowstone River Valley, including the states of Montana, Wyoming and North Dakota, and today their reservation is south of Billings, MT. Dave McGary's bronze sculptures of Native American Indians have been praised for their historical accuracy, fine craftsmanship and detail. The sculptor grew up in Wyoming, where he made clay figures from a young age, but as a teenager he spent a year studying in Italy where he analyzed the human form and practiced bronze casting. This exposure to Renaissance sculpture influenced his works. He moved to Santa Fe and became an adopted member of the Sioux tribe where he met and sculpted out of bronze many of the tribe's leaders. Today, his works have been publicly displayed in Santa Fe as well as the Senate Rotunda in Washington, DC. 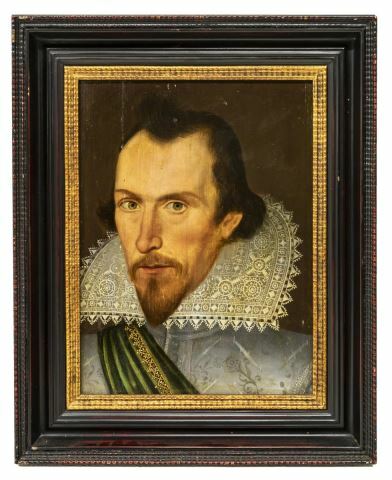 A framed oil painting on a wood panel, this depiction of a Jacobean man with an intricate lace collar is sourced from the 1600s. The Jacobean era aligns with the reign of King James I (1567-1625), a time marked by the proliferation of portraiture by Anthony Van Dyck, Daniel Mytens and Sir Nathanial Bacon that emphasized attention to detail, classical elements, rich color and lavish embellishments as international trade expanded. Sourced from the Unitarian Church in Glossop, England, this Gothic Revival lectern topped by a magnificent eagle was carved in 1896 out of oak wood. It was donated to the church by the wife of Isaac Jackson, a saddler who patented a belt-fastener and manufactured shell detonators during World War I. This bronze garden fountain from the 20th century is supported at the base by four maidens, two of which are playing musical instruments. They hold up the basin of the fountain which is decorated by lion's heads on the exterior. At the center two hippocampuses (half horse, half fish) leap outwards. Crowning the fountain is a putto, or a cherub, who holds a basket of fruit atop his head.